If you’re after a desk, it’s hard to know where to start. There’s thousands online, from standing desks and monster work stations to dinky things that you can just about squeeze a monitor onto. We’ve filtered through the noise to bring you the best of the best, no matter what your requirement. Right now the House by John Lewis Airframe Desk is the best desk you can buy in our opinion. It’s the right size for most people, it looks stylish, and it’s dead easy to put together. Having a glass top means you can easily see what’s in your drawers, which is a rare luxury. The price is not too shabby, either, and you’ll get the usual John Lewis guarantee as a safety net. As the name suggests, John Lewis is the only retailer you can buy it from. But it does pop up on ebay from time to time if you have the patience, and you should be able to get a healthy discount on John Lewis’s £299.99 price tag. Recent auction lots have sold for around £250. There’s two choices of colour. We prefer the white to the grey – these colours only refer to the colour of the drawer, and the ‘grey’ desk actually has white legs. The white model looks better, to us at any rate, and its wooden legs will blend in to wherever you want to put it. Measure, measure, measure! Make sure it will fit your space – ideally without totally filling and overwhelming it, although we appreciate desks do tend to get crammed into smaller rooms. Also, make sure the surface area of the desk is big enough to take your computer and associated paraphernalia, plant pots, coffee mugs and whatever else you habitually keep on your desk. A drawer or other storage space can be invaluable. Also essential: check how much assembly is required, and make a realistic call on how much you enjoy assembling things. Take it from us, putting together a desk can be a nightmare. A stylish desk with a minimalist design that looks good in any setting. Normally we wouldn’t go for a glass-top desk, but we’re forever losing things at the back of our desk drawers. With the Airframe desk you can see exactly what you’ve got in storage, which helps you be more organised. The drawer is a good size and spans the full width of the desk, providing plenty of space for documents, stationary and other knick-knacks. With a worktop measuring 78cm by 125cm it’s not the widest but it is deep. It’s plenty big enough for everyday use, whether you want a work station with a monitor, a writing area, or just a large side table, and the slightly smaller footprint means it will fit into tighter spaces than other desks will. We like the angled design, too. It’s an understated aesthetic that looks much better in a home than in abstract against a white background. Because it has so few parts, assembly is idiot-proof, which is always a bonus. The fact that it’s from John Lewis means you’ll be getting all the bells and whistles that come with that, including a two-year guarantee (most offer one year as standard). You can also buy it with interest-free credit if you spend over £1000 with the retailer (which, let’s face it, is not hard). On the down side, the glass top can be annoying to keep clean. Whereas other desks can mask the scuffs, the Airframe will pick up all your fingerprints and show up all the dust. Just keep some glass cleaner and a cloth handy. But that’s pretty much the only drawback: as long as you’re happy to have a glass table top then you won’t go wrong with this one. A close runner-up, this one. It’s a large, sturdy corner desk with one standout feature: it’s ‘reversible’, which basically means you can build it with its longest portion on either the left or the right. That’s handy, because it means you can shape it to fit whatever space you have available. Its keyboard drawer can fit on either side too – short or long – just to give you a bit of extra flexibility. It’s built with a steel frame, and it has a load rating of 60kg, so you can safely pile as many monitors and speakers on as you’d like. The longer portion (including the corner space) measures 170cm long by 60cm wide, and the shorter portion – which tacks on the side – is a healthy 60cm by 80cm. You won’t be running out of space. The reason it doesn’t take the top spot is because it’s not the best looker. The graphite finish and the two grates that fix to the back of the desk make it look a tad cheap. However, if you don’t mind the look of it yourself, or you’re just not planning to show it off to anybody, then you could do a lot, lot worse. You can buy it on Amazon or on Piranha’s website. It’s slightly cheaper buying direct – £117.95 compared to £129.95 on Amazon. Oh, and you should definitely choose the black finish. Herman Miller is known for its office desks but its height adjustable Sense Desk – available through John Lewis – looks neutral enough for you to use at home. While it won’t transform into a standing desk, its height goes up and down in 2cm increments between 61cm and 85cm, so it will be a snug fit whatever your height. At 140cm by 60cm deep there’s no worries about a lack of surface space, and you can assemble it without any tools. On the downside, it has no storage space to speak of, not even a keyboard tray. The cost is another sore point too: at £550 you are getting quality design and materials, but it’s more than double some of the others on this list. If you’re looking for something that can flip between a normal and standing desk, then this is the one you want. It’s built for a commercial setting, but it’s sleek enough to work in a home office, and not too large either, measuring 160cm by 80cm. 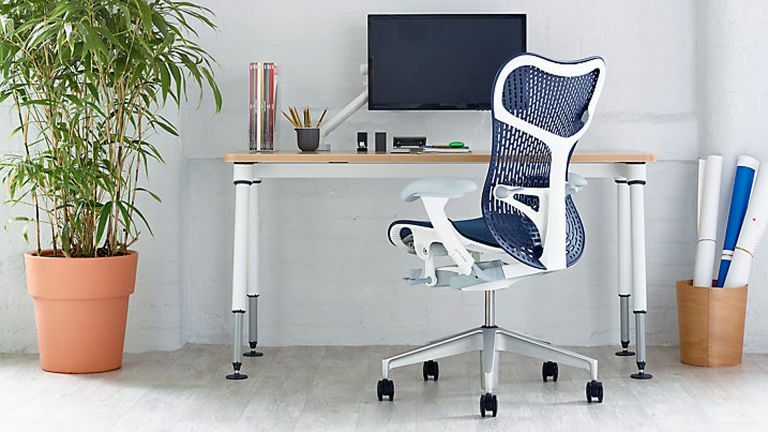 It will adjust in height from 70cm to 120cm with one squeeze of a paddle, so that you can work upright if you prefer (or if you have a bad back or posture). But it’s not perfect: it needs a fair bit of work and a few tools to get set up. And then there’s the price: £1,299, available from John Lewis. Not everybody has that kind of money to spend on a desk. If you do, then this is a good option. You get what you pay for. The Jual Curve has a funky design that might split opinion. We like with it, especially in the curved oak and white glass design, made from real oak veneer and safety glass. It’s smaller than the average desk, measuring 61 deep by 130 wide, and some of that width is taken up by chunky wooden edges. It’s really a laptop desk, built for those who have less space to play with. So if you’ve got a large room to fill you might want to look elsewhere. There’s no in-built storage either, which is a shame. Really, it is all down to the look: one glance and you’ll know if it appeals to you.